Attracting with a Hummingbird Feeder. Things You Should Consider. Attracting with a hummingbird feeder was an idea first conceived by a scientist. It was constructed out of a test tube from his laboratory for his wife who loved hummingbirds. People have been enchanted by hummingbirds in their gardens for more than 50 years. In 1950 the Audubon Novelty Company of Medina, New York introduced a commercial feeder. 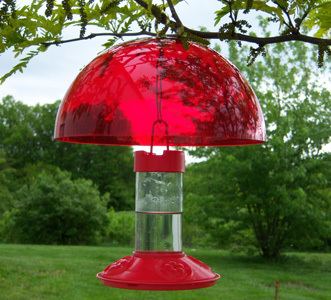 Today, hummingbird feeders are available in a vast array of attractive styles and materials. The choice of which feeders to buy can be confusing. You can consider the decorative value. It is not always necessary to choose red feeders. Most have red petal-like feeding ports. TIP: Hang red ribbons from the feeder and trees, bushes or anything nearby to first attract hummingbirds to your feeder. Once you have visitors, take the ribbons down, you'll have a friend for the season! 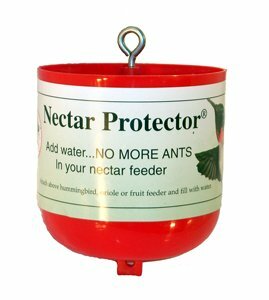 When starting out, it is better to buy small feeders which will be re-filled more often avoiding nectar spoilage. If you prefer to buy a large feeder, fill it partially until you start to see hummingbirds in numbers. We recommend hanging your feeders 2 weeks before the hummingbird migration starts.The Migration can fluctuate from year to year. If you notice a hummingbird before your feeders are out, get them out right away. There is a table of "Estimated Arrival Dates" by state located on our Migration Page. Hang from metal hooks, garden stakes, or tree branches. Place several feeders out of site of each other because male hummingbirds are territorial and will be on guard fending others away. (I remember witnessing such an event with our first feeder that hung from a plant hanger outside our kitchen door. On a rainy day a male hummingbird perched on the hanger standing guard and would not let the others near. We believe the more feeders you display; the more hummingbirds you will attract. Another tactic is to place several feeders together since one male may not be able to control them all. Locate them in the shade or use a "feeder cap" which provides shade over the feeder to prevent spoilage from the sun. Situate near flowers to help our friends find them. You can later relocate them, a few feet each day, closer to your windows or doors. If you purchase feeders that come apart, it will be an easier job to keep them clean. Cleaning is very important to prevent mold and bacteria. A good brush kit can make this job much easier. Click here for instructions and tips on cleaning your hummingbird feeders. Bees and ants are attracted to hummingbird feeders. The problem can be easily solved. You can choose a feeder that is designed to prevent bees from penetrating through the feeding port to access the nectar reservoir. Another solution is to use a "Tray Feeder". The nectar level is low enough below the feeding ports that bees can't reach the nectar and will give up. Click here to see our page on bee problems. Ants, in my opinion, are worse intruders than the bees. They come in force, in the hundreds, to help themselves to the tasty delight. Click here to see our page on ant problems. Attracting with a hummingbird feeder is easy. There is a wide array of hummingbird feeders that will attract hummingbirds. 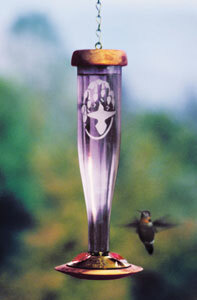 There are also many styles of hummingbird feeder choices available.